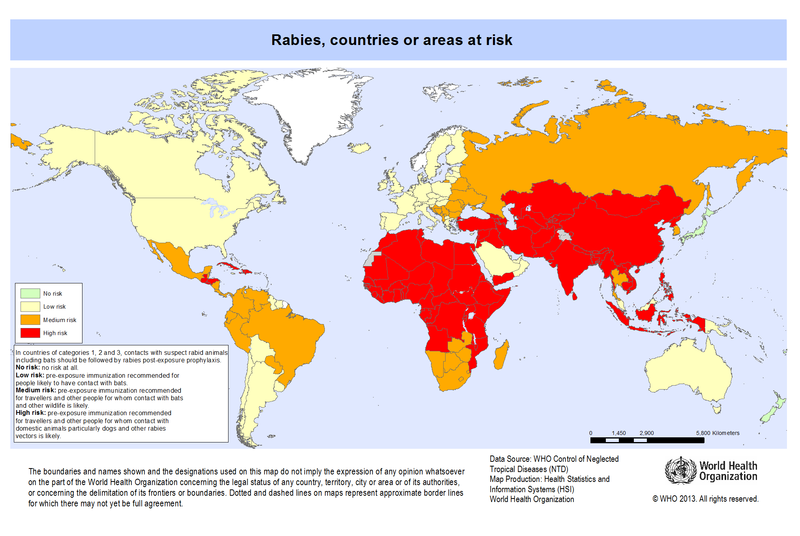 Rabies must be treated early – before symptoms develop – or the disease is fatal.2 Although infection is relatively rare in humans, about half of those who do contract rabies are children under the age of 15. Vaccination to prevent rabies infection before exposure is reserved for people at high risk of contact with the virus, either because they work with animals or they’re travelling to areas with a high risk of rabies... read more. Rabies doesn’t only affect animals. Do you know what to do if you’ve been bitten? In addition to over 1,500 clinics administering the rabies vaccine on Vaccines411, we have gathered a list of reliable resources on rabies. Click on the links below to answer your questions on how it is contracted, who is at greater risk of contracting rabies, what signs to look for, how it can be prevented etc. When you are done, make sure to find the clinic nearest you offering the rabies vaccine by entering your postal code in the search box above, and selecting the "travel" category.